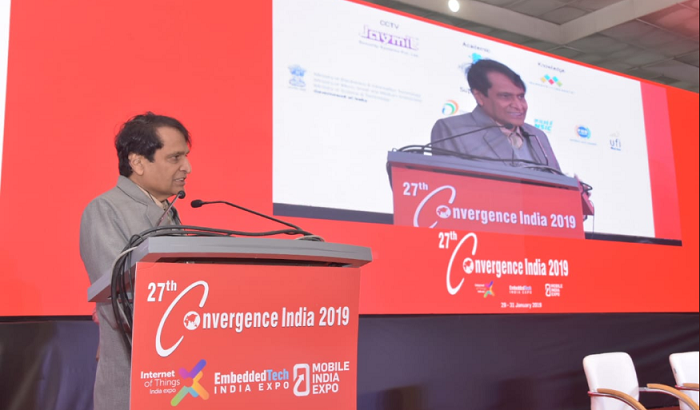 Delhi, January 29: “India is optimally leveraging technology to offer various services on digital platforms and is poised to take full advantage of new generation of technological advancements”, said Commerce and Industry Minister Suresh Prabhu in his inaugural address at the path-breaking Convergence India 2019. Expressing that digital technologies are advancing and becoming all pervasive, the minister stated, “The future of digital services will be based on convergence, and effective use of broadband adding”. Convergence India 2019 was opened on Tuesday, January 29 on Pragati Maidan, New Delhi by Mr Prem Behl, Chairman, Exhibitions India Group, India, while the Keynote address was given by Ms Aruna Sundararajan, IAS, Chairman Telecom Commission & Secretary, Department of Telecommunication, Government of India. Launched in 1992, the Convergence India series of expo is credited as India’s leading Communications, Broadcast, IT & Technology Show. Convergence India expo is the most influential and relevant trade event for the ICT, broadcast and digital media industry in India which is a great platform for all the exhibitors to reach out to a large and relevant audience. The three-day exhibition and concurrent conference sessions will flash light on the latest trends and technologies in Telecom, Broadcast, Cable and Satellite TV, Cloud & Big Data, IoT, Digital Homes, Mobile devices, Film and Radio, Content Creation, Management and Delivery, etc. Over 25,000 trade visitors including Key government officials, MSO's, D2H players, Cable TV professionals, System integrators, Broadcasters, Satellite operators, Distributors, Cable operators associations, Broadcasting Associations, etc. Hon’ble Minister, Ministry of Commerce & Industry and Civil Aviation, Government of India, Suresh Prabhu was the Chief Guest at the inaugural ceremony of the three day conference. "Some countries will have a natural advantage in offering these services for all the platforms, be it the government services, business to business or any other service”, said Prabhu in his speech. "Our ministry is working on promoting services in a big way for which we set aside Rs 5,000 crore to promote champion sectors of the service sector, in which IT and related services will play a key role. We will ensure the sector develops, creates job opportunities and ensure complete coverage of the population to eradicate digital divide, through digital literacy and infrastructure development”, he further added.